Jim had many jobs through his school years, some of them were delivering daily papers, selling magazines, mowing lawns, caddying, etc. He was too young to enlist in WWII, but he did work as an inspector at an ammunition plant in his hometown. Jim loved animals. While delivering the daily newspaper, his dog Spot would follow him on his bicycle. He dearly loved Spot! Prior to moving to Arizona, we had two cats (brothers) named Smokey and Bandit. In the evening, after a long day working outside, Jim would recline in his chair with Bandit wrapped around his neck on the back of the chair, and Smokey in his lap, all three taking a well-deserved nap. After moving to Arizona, Jim and Jeannette adopted a beautiful Golden Retriever, Ginger, who was his constant companion. Wherever he lived, he was a volunteer with many charitable organizations including Habitat for Humanity. Regrettably, because of difficulties with Parkinson’s disease, Jim was unable to continue volunteering. Jim was interested in Scouting, as were his brother and sister. Jim and his brother were Eagle Scouts, and their sister was awarded with a Gold Award from Girls Scouts of America. Jim attended Wabash College and was a graduate of Indiana University. He enlisted in the Air Force in 1951 and completed the Aviation Cadet program, obtaining a navigator ranking. After his combat tour in Korea, Jim obtained a pilot rating at Webb AF Base, Texas. Later he became an Instructor Pilot in the T38A jet. He loved this job! In the mid-sixties, Jim taught ROTC at Purdue University. He had assignments in Morocco, Spain, Vietnam, Thailand, and the Philippines, and of course many at United States Air Force Bases. He was so happy he decided to make a career in the military, serving his country. Jim had a deep appreciation for having a vital part in protection of his country that he so dearly loved. 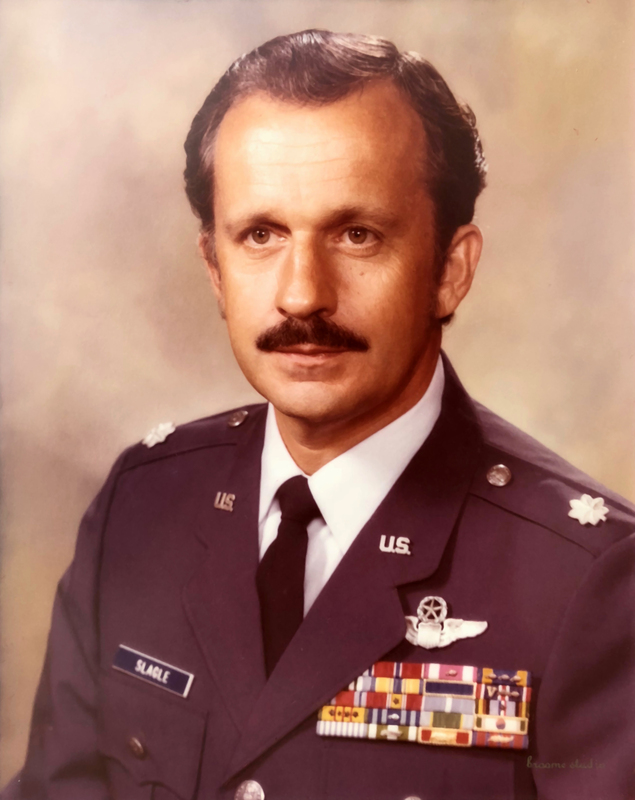 Jim received many awards and decorations during his military career including: The Distinguished Flying Cross, the Bronze Star Medal and the Meritorious Service Medal. After 26 years in the Air Force, Jim retired as a Lt. Colonel in 1976. Jim was also very proud of other Slagle men who served in the military: his grandfather (Civil War), his father (WWI), his brother (WWII), and himself (Korea & Vietnam). Jim was preceded in death by his parents, L.O. and Jeannette Slagle of Lebanon, Indiana, his brother Jack Slagle of Muncie, IN, his sister Huldah (HUD) Clark, her husband Harold P. Clark of Williamsburg, VA. He is survived by his wife of 28 years, R. Jeannette Slagle of Gilbert, AZ, his children, Rich Slagle (Heather) of Fargo, ND, Scott Slagle of Minneapolis, MN, Kimberly Slagle of Laguna Niguel, CA, his step-children, Melissa (Mimi) Lawrence (Dennis) of Queen Creek, AZ and Breck DeWitt (Carolyn) of Brentwood, TN, his sister-in-law Emma Lee Slagle of Muncie, IN, as well as eleven grandchildren and seventeen great-grandchildren, and many nieces and nephews. My deep condolences to the Slagle family, I was really touched by the loss of your loved one. When a precious loved one falls asleep in death, it brings to mind God’s precious son Jesus. It is comforting to note how he viewed death. I would like to share it with you from the gift that the Most High God has given to each & everyone of us. His written word the Bible in the Book of John chapter 11 verses 11-14.